Argan Oil is produced from the kernels of Argan tree in Morocco, and it is considered to be one of the rarest oils in the world due to the small and very specific areas in which it is grown. It needs 30 kg of kernels to extract just around a litter of this precious oil. Scientifically proven, this oil is able to correct the age related deficiencies in skin that causes dehydration and loss of skin elasticity. It is found to contain 700mg per kilogram of tocopherols (Vitamin E) that is twice the amount found in olive oil. It also has Vitamin A, Omega 6 and 9, unsaturated fatty acids. How to Use: As a moisturizer, apply 2-3 drops of Argan oil after clean and tone your face. As a facial massage oil, use 10 drops and massage your face and neck gently and spirally. 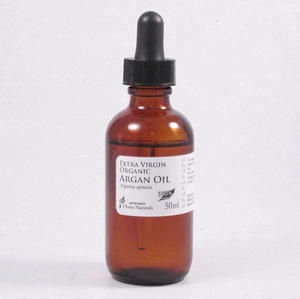 Argan Oil is known to make hair stronger and healthy looking. As this oil is non-greasy, its application won’t make hair look sticky and oily. How to Use: Apply a few drops of Argan oil to hair as often as required. As a scalp massage oil, apply 10 drops to your scalp and massage in, leave for 5min and shampoo as usual. Shelf Life: 1 year after purchase and 6 months after opening.